It was an honour to have the opportunity to listen to Alberto Antonini speak about his experiences and to sample wines he has either produced himself or that have come from wineries for which he is a consultant. 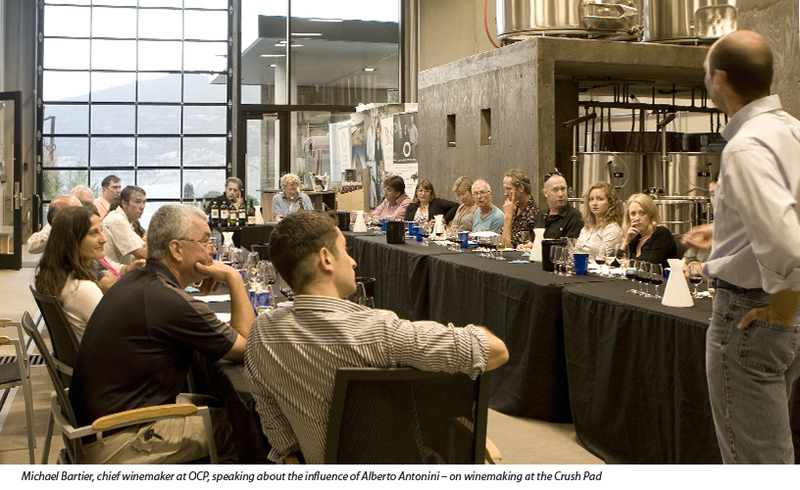 Antonini, one of the top oenologists* in the world, has been consulting to the Okanagan Crush Pad since August 2010. He is also winemaker and consultant to wineries in Chile, Argentina, Italy, California, South Africa, Portugal, Uruguay, Armenia and Australia. Alberto’s home is at Poggiotondo, a 100 acre property in Italy’s Chianti region near Florence, where he combines his worldly experience with his passion for traditional winemaking. He is known for bringing balance and harmony to the process – working in a gentle manner and mixing evolved thought with traditional technique. Alberto Antonini graduated in Agricultural Science from the University of Florence and his education includes oenological courses at the University of Bordeaux and California’s UC Davis. 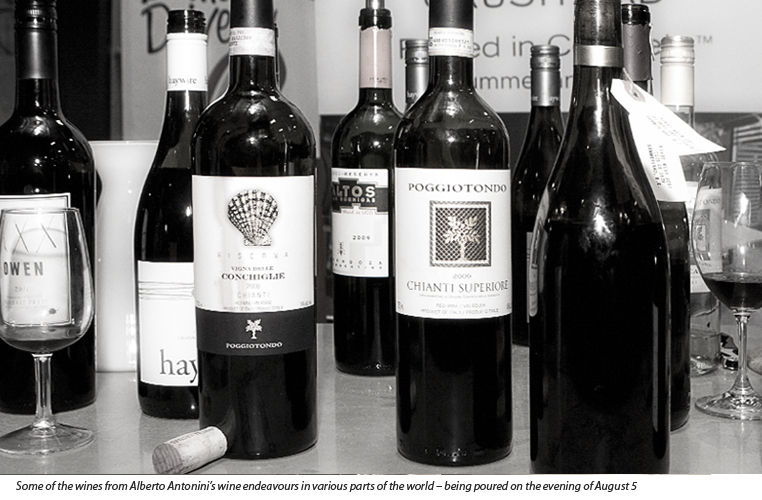 His first work assignment was as assistant oenologist with Frescobaldi, Tuscan winemakers since 1308. As an interesting aside, according to Wikipedia the Frescobaldis traded wine for paintings with Michelangelo. They also supplied wine to Henry VIII – so they were not exactly newbies in the business of wine. Alberto went on to later become the Technical Director at Col D’Orcia in Montalcino, producers of the lovely Brunello di Montalcino. After that he became Head of Oenology at Antinori, a winery founded in 1385, whose motto is suitably ‘Passion in Evolution’ – a winery still family-owned twenty generations later. 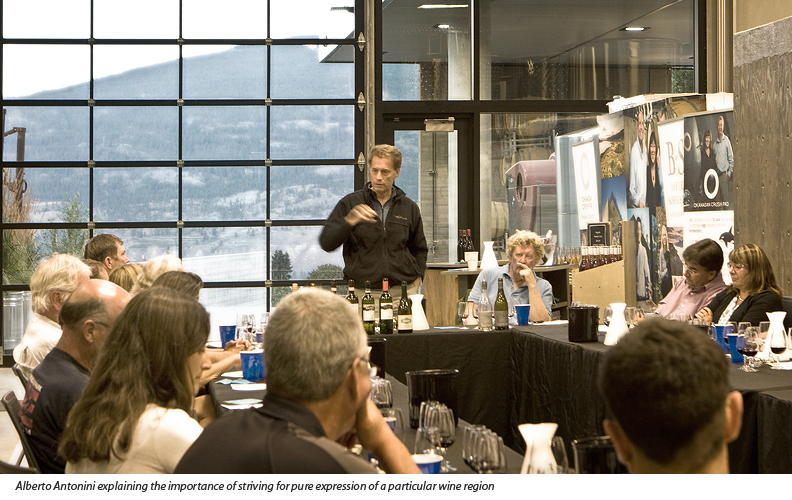 Alberto Antonini first visited the Okanagan in 2010 to provide advice concerning the Okanagan Crush Pad and the Switchback Vineyard – to owner’s Christine Coletta and Steve Lornie. Alberto has been working with them since, and is also now part of the team designing OCP’s new vineyard in Garnet Valley. 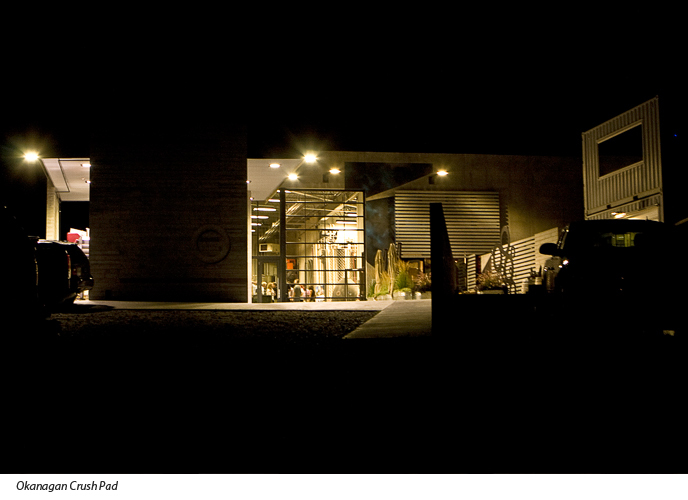 Michael Bartier chief winemaker at OCP told guests on August 5th, that the day Alberto Antonini left after his first visit in 2010, was the day they began to wean the vines off herbicides. They introduced organic fertilizers but ironically, it is not healthy for the plants to go cold turkey from artificial fertilizer to a healthy lifestyle so they had to ease them off the “drugs”, as they call them, a bit at a time. The next year there was a lot more natural compost and manure and a lot less of the herbicides. In fact the purity level in the vineyards is now high enough that they could seek out organic classification but the process of certification is difficult and involves a lot of hard labour. A recent walk through the vineyard, according to Bartier was a happy experience where everything felt alive; there were insects everywhere and down deep into the earth as well as between the rows and it was all rather wild and messy – as it should be in an organic model. 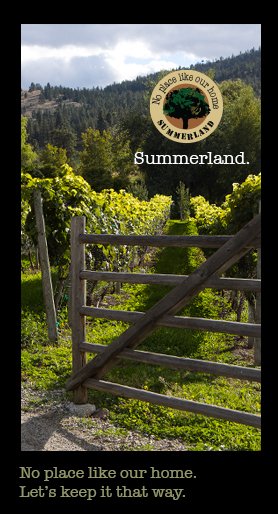 Bartier also reported that Vineyard Manager Theo Siemens is a diligent follower of Antonini’s prescribed treatment, and the keeping it natural approach has been instrumental in the success of wines such as Haywire’s Wild Ferment. According to Bartier, the oak used in winemaking is also critical and upon the advise of Antonini, Okanagan Crush Pad made changes in how the wine was stored. Initially OCP had smaller oak barrels but Antonini advised them to switch to larger vessels that would have a more discreet surface; smaller barrels being overpowering in the amount of oak per volume of liquid. 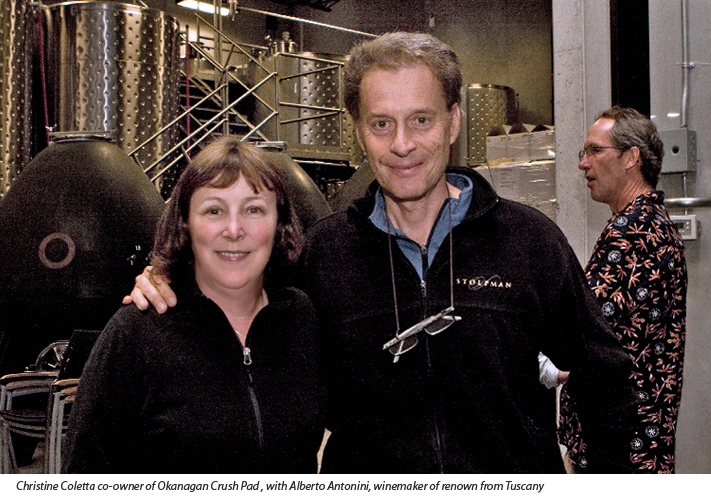 David Scholefield of the wine agency Trialto Group, is a longtime friend and colleague of Antonini’s and it was David who was instrumental in bringing Alberto to Summerland. 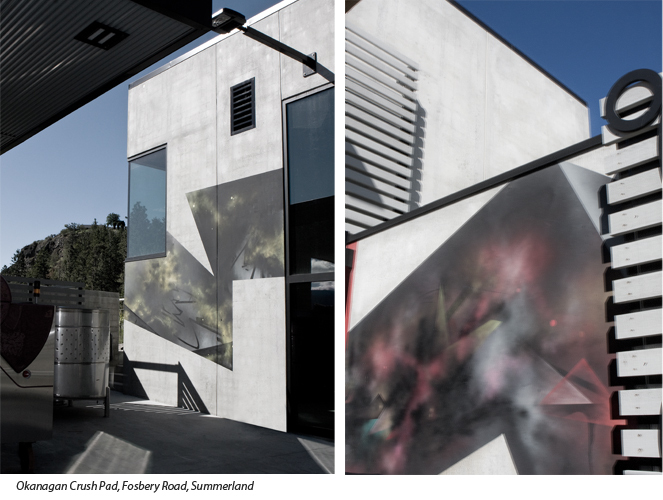 Scholefield’s motto is ‘wine is narrative!’ and he says things like ‘place not grape!’ and refers to wine as ‘liquid art’. Also check out the story we did on Pedro Parra, friend, terroir expert and associate to Alberto Antonini. *Oenology is the science and study of all aspects of wine and winemaking except vine-growing and grape-harvesting, which is a sub-field called viticulture.